I could easily have downed two packages of the shrimp cocktail, long an astronaut favorite. The six medium-size orange shrimp were just a touch chewy after their slapdash, 10-minute water bath, but they looked and smelled like what you get at the supermarket. NASA's cocktail sauce is spiked with plenty of horseradish and salt. If anything can revive tired taste buds in space, this dish is it. I chased it with a pouch of powdered mango-orange drink. The lush but tangy mango flavor juiced up the orange's sweetness, and the mango aroma was pronounced. It was delicious. 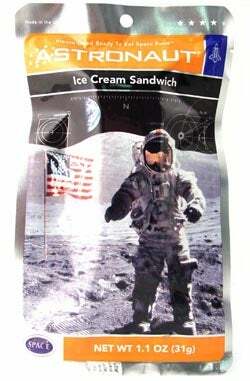 The food scientists had also sent two breakfast items, freeze-dried "Mexican" eggs and a sausage patty. The eggs, colored a bright buttercup yellow, were bouncy and broke down into small, dry curds. Flavorwise they were like a reluctant suitor, vaguely sweet but unwilling to make the full taste commitment. Hot sauce, ketchup even, would work wonders here. Nothing, however, could have saved the sausage patty.